I was in Cirencester again the other week, showing off this lovely market town to family - as you do! An important ancient Roman settlement in the rolling Cotswold Hills of conquered England, Cirencester sat at an important intersection of painstakingly constructed, long distance Roman roads. What we noticed was that hares abounded - literally - in classy shop windows and in sophisticated courtyards. These hares were big - about 5 feet high - and beautifully decorated in a variety of styles to complement the elegant model. I remembered that other hares, now missing, had been much in evidence on a previous visit Easter to Cirencester, part of a town-wide charitable sponsorship event. But why hares you may ask? Well several important mosaics have been unearthed within the remains of excavated Roman villas, municipal bath houses and the like in Cirencester’s environs. 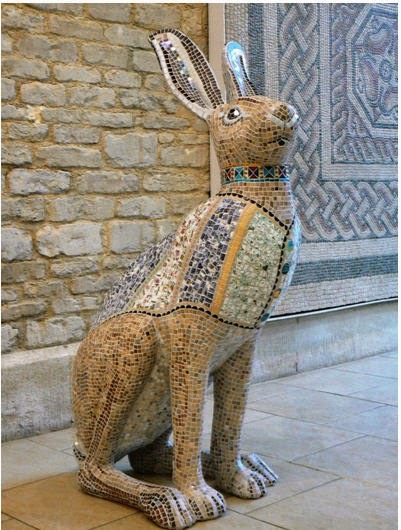 One of the most impressive mosaics, discovered during town centre redevelopment in the 1970s, features a lovely hare. I think therefore we have the answer to our hare question. 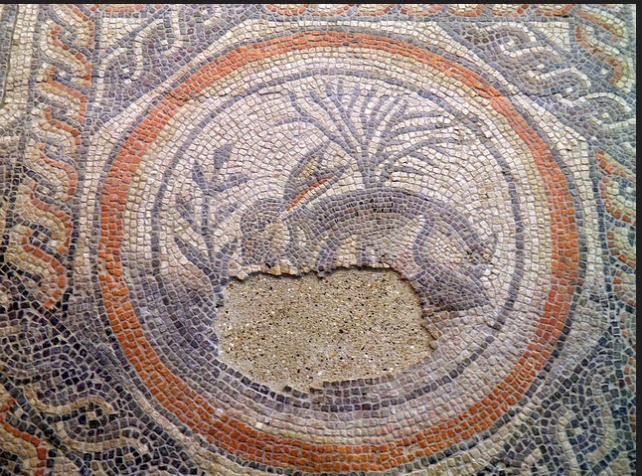 Members of the biological family Leporidae, early Roman hare and rabbit husbandry involved keeping them in “lepotaria” or walled gardens on villa estates. Here they happily reproduced and were periodically caught using ferrets, to be served up as gourmet dishes. Romans believed that the meat of the hare helps to preserve beauty, the Emperor Alexander Severus 222-235 AD ate it every day! In Medieval times in Britain the Roman practice continued at least as far as rabbits were concerned. Walled and paved courtyards forcing them to breed above ground. However it is unlikely that hares, which do not burrow, continued to be kept in this way. Records, such as they are, from earliest Medieval times hares were considered game to be hunted. Pre-dating the Romans, Greek hunters on the island of Crete trained fast, slender greyhounds to hunt their hares. Apparently the Greeks enjoyed hare plainly spit-roasted. Back in 350 BC Archestratus, the Greco-Sicilian father of gastronomy and author of one of the world’s first cookbooks, stated “the true gourmet is he who is not disgusted by an undercooked hare”. Sounds like a dish that would divide opinion even today! MedievalMorsels models one inch scale rabbits set on medieval butcher’s blocks. Dollhouse food that will equally suit Tudor, Gothic or rustic miniature settings.